Observing what can happen in your own garden even in suburbia! I used this phrase for a recent Facebook post and all my G&S enthusiast friends came back with, “Summer’s rose ..” thinking of the lovely madrigal in Ruddigore. But it’s so true – spring is green! It’s probably the time of year when we appreciate the colour green the most. Owning, as I do, a garden bordered by lilac, you do get rather fed up of the brown twiggyness of winter. Whilst I love my lilacs (see Luscious Lilacs), it has to be said that they do sadly contribute to winter dullness. From March onwards, I find it hard to resist walking around the garden taking photos of the new green emerging and now, in April, everything is positively zinging! The hawthorn, which entered April with a generous smattering of new green leaves, conveniently displayed against a vivid blue sky, is now a dense canopy beginning to show the signs of flower buds getting ready to welcome in May. In the ‘woodland’ garden, as I like to call it when feeling posh, the euphorbia has been excellent this year. This one is only the common woodland spurge but we brought it from our previous house and it took to this area with enthusiasm until a couple of years ago when I became quite worried as it looked sickly. It’s good to see that it appears to have bounced back. I’m pleased to say that my Euphorbia Martinii, purchased at Malvern last year, has also returned. I was worried about it, to say the least, as it became rather swamped by a couple of over-enthusiastic dahlias last summer! One of the really exciting greens at this time of year are the very first shoots of new seedlings in the greenhouse and on the veg plot. My rocket was first to be sown, first to germinate and also first to be eaten! I now have peas and French beans following in its footsteps and my tomatoes are almost ready to be pricked out and potted on – a task for the Easter weekend I think. Last summer we also planted a number of new roses, five I think in the end, and I’m pleased to say all look to be doing well. However, it was the new leaves of our existing Iceberg climbing rose that really struck me last weekend. It was as if someone had been out and polished them up ready for the new season! These particular shoots were especially good to see as they were on new long stems stretching into the pergola, a direction that we’ve been trying to train it into for several years. Which just makes me think that I shall have to write a post later on this year entitled “Summer’s rose”!! But before I sign off on this post, I’m going to leave you with some lovely vibrant green which, ironically, is providing a fantastic backdrop to that most spring-like of spring flowers, the bluebell!! Categories: Blog post | Tags: Bluebells, Euphorbia, Lilac, Malvern, Roses, Seeds, Spring, Woodland | Permalink. 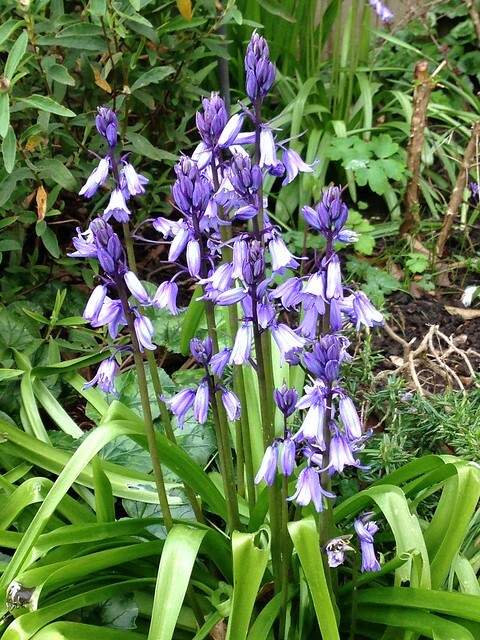 Is it me, or has it been an exceptionally good year for bluebells? We had more clusters around the garden than usual and out on our recent travels, it felt like the bluebells travelled with us – slightly past their best in the South, amazing vibrant carpets of blue in the Midlands, and just emerging in Scotland! Are they English or Scottish? Was a question I was asked recently about our own garden bluebells and, with an air of disappointment, I was forced to admit that most of them are probably Spanish! The Spanish bluebell has been invading the South East for a good many years now and so I fear our proliferation is in this direction rather than in the deeper, richer coloured and more elegant English variety. In fairness, when I look at the cluster in this photo, I’m heartened to see that there may be a mix of English and Spanish. The Spanish variety are paler and more upright whereas the English are darker and have a tendency to arch, with the flowers displayed on one side of the stem only. Looking at that stem on the far right of the photo, that looks more English to me! The only downside to this excess of bells is that they now need deadheading! I took a good bag full of stems down to the compost bin one warm afternoon this week. And whilst the Spanish may be a troublesome invader, I have to admit that I do still quite like them. After all, who can resist the depth of blue in this clump? True blue flowers are few and far between and these looked stunning complimented by pink blossom and purple tulips and have even given me an idea for planting next year – so watch this space! 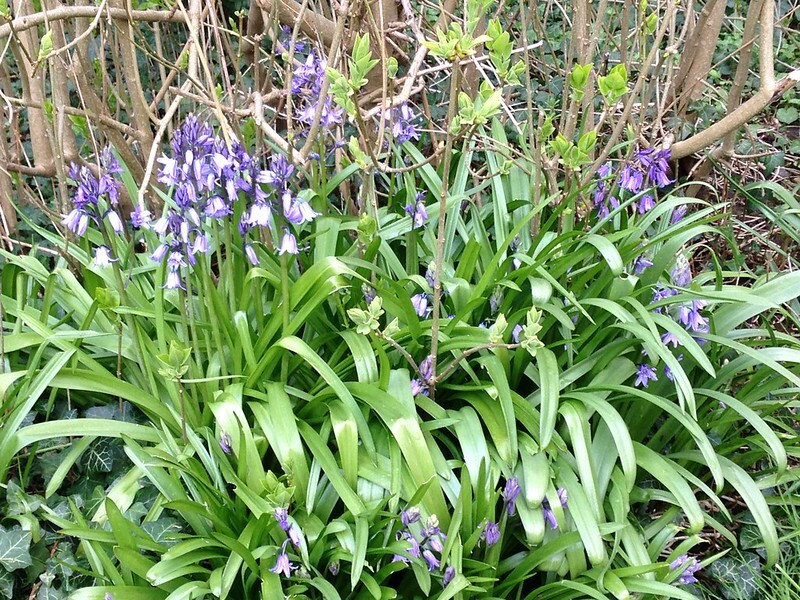 Categories: Blog post | Tags: Bluebells, Spring, Tulips | Permalink.